Ivan Aramayo outlines the benefits of a wireless online platform to manage electronic locks in work camps. Managing the inflow and outflow of both temporary and permanent staff in work camps presents many security issues that must be properly managed. Traditional mechanical keys are no longer a solution, because they are simply unmanageable. In addition to not providing any real security, they offer no traceability of who has been where and when, it is impossible to track copies of keys that might have been made, and cylinders must often be replaced. With all of these factors combined, mechanical keys are simply not the solution when locking systems have to manage thousands of cabins and thousands of employees coming in and out during both the construction and the management of the sites. Electronic locks have been solving those problems for the past three decades, because properties can set up who has authority to enter which doors at what time of the day. 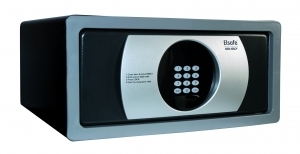 Through an audit trail, electronic locks also provide information about who/where/when has been using each lock. In addition, losing a keycard no longer requires replacing the cylinder. By simply reprogramming the lock or encoding a new keycard, the lost keycard can be cancelled. However, over time, even these widely used electronic mag-stripe locks have now become outdated. Although they are still a valid solution for other installations where the validity of the keycards is short (ie, for a typical hotel stay, which is one-four days on average), mag-stripe technology is not suitable when you need to manage a site where employees and staff are long-time users of the installation. The mag-stripe card information can be easily corrupted and erased by being in close proximity to magnets, smart phones etc, which causes many inconveniences for permanent staff. 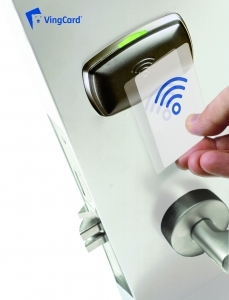 In the 21st century, contact-less RFID technology has become the most popular technology for electronic locks. This trend began earlier for high-level security access solutions, but since the mid-2000s all major international hotel chains have also adopted this technology as the standard for electronic locks. Undoubtedly, it provides significant benefits compared to insertion mag-stripe technology. 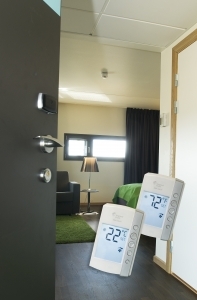 For example, electronic locks no longer have a slot, which exposes the electronics to the elements and makes the locks more sensitive to outdoor environments. RFID electronic locks are completely sealed and therefore provide perfect performance for outdoor applications, which is the typical scenario for work camp sites. In addition, from a user-perspective, RFID electronic locks are much more intuitive to use and from a site-management perspective. They provide additional security features, as well, such as anti-cloning technology whereby RFID keycard information cannot be cloned, as opposed to mag-stripe technology. RFID technology also brings substantial benefits to site management and maintenance, since RFID electronic locks can not only read the information encoded in the keycards, but can also write back information on each staff and personnel RFID keycard. Therefore, it is possible to read out the events from each user keycard and obtain a detailed activity tracking of each staff and personnel. At the same time, personnel keycards can be used to reprogram and change the RFID electronic lock settings, therefore avoiding having to travel to each and every lock to change the access parameters of the site. However, even the benefits of contact-less RFID electronic locks still have room for improvement. Site managers would like to have all electronic locks managed instantly from a central location, where they can check the event audit of the lock, control all the employees and keycards issued directly and instantly from the central server, and be able to modify any single parameter on the go. Putting this solution in place has not been economically feasible before, due to the troublesome issue of having to wire all electronic locks in order to connect them to the central server. This is exactly where the true benefits of a wireless online platform for electronic locks come into place. With a wireless online system, all electronic locks remain stand-alone and simply operate with batteries, so no cables are required. Instead, they are connected through a secured wireless platform. This allows the best of both worlds: all the online capabilities of the network, avoiding the high installation and maintenance cost of a cable infrastructure. A wireless online solution allows site managers to remotely control and manage all the electronic locks, making it possible to read out all events from the locks at any time. It also prompts alarms for low-battery status, door-ajar situations, etc., while managing all users access rights and being able to change and adapt on the go. It allows for easy control of all aspects of keycard management, from cancelling and renewing to changing access validation zones and timeframes, etc.